This is a quick and fun DIY to get you through the week! 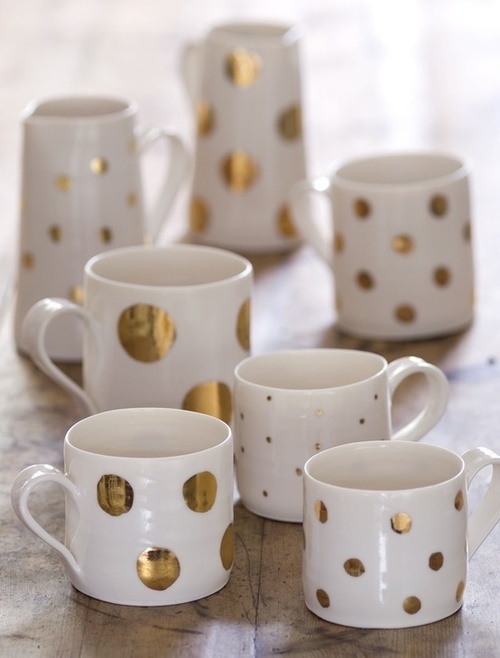 Decorate a mug with a Krylo paint gold leafing pen and bake at 350 degrees. After 30 minutes of baking, let it cool in the oven. I am a huge fan of polka dots but you are welcome to create any design your heart desires! Happy crafting! This DIY makes me so sad. I attempted this project as per the directions - and unfortunately, the results pictured are not the results that I had. The finish from the gold sharpie is matte - not shiny as pictured. Is there a step that was omitted in the steps provided? My apologies! I updated the instructions with the correct info. Use a Krylo paint gold leafing pen which simulates a rich and opaque metallic finish. I love this DIY! This one and the gold pleated white bowls! I am not sure if these will hold up in the dishwasher, sorry!